Oak Hill Cemetery in Washington, D.C., U.S.
Dean Gooderham Acheson (pronounced /ˈætʃɪsən/; April 11, 1893 – October 12, 1971) was an American statesman and lawyer. He was a member of the Democratic Party. Acheson was born in Middletown, Connecticut. He studied at Yale College and at Harvard Law School. He married Alice Stanley in 1917. Acheson served as the 51st United States Secretary of State under President Harry S. Truman. He served as Secretary of State from January 1949 to January 1953. He helped defend America's foreign policy during the break of the Cold War. Acheson's most famous decision was convincing President Truman to intervene in the Korean War in June 1950. He also persuaded Truman to dispatch aid and advisors to French forces in Indochina, though in 1968 he finally counseled President Lyndon B. Johnson to negotiate for peace with North Vietnam. 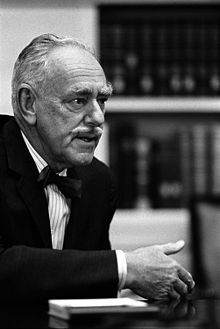 During the Cuban Missile Crisis, President John F. Kennedy called upon Acheson for advice, bringing him into the executive committee (ExComm), a strategic advisory group. Acheson and his wife Alice had three children; David, Jane, and Mary. He remained married to Alice until his death in 1971. He retired shortly after 1955. Acheson was awarded the Presidential Medal of Freedom in 1964 by President Lyndon B. Johnson. He also won a Pulitzer Prize for History in 1970. Acheson died in Sandy Spring, Maryland from a massive stroke. He was 78 years old. He was survived by his two surviving children, David and Mary. He was buried at Oak Hill Cemetery in Washington, D.C.. This page was last changed on 10 August 2018, at 10:56.